I am so happy to come across another great African American footwear designer (we previously highlighted Stella Hues) and it is always my pleasure to introduce you to new brands. 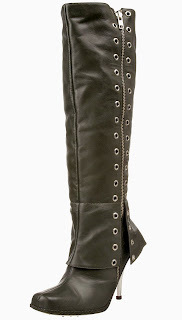 I instantly fell in love with the Samanta Shoes Dilla Boot in dark olive (also available in off-white, preto (black), and palha (tan) if you're looking for more classic colors). Featuring a full leather upper, metal grommets that go all the way up the 17 1/4" shaft, a peplum detail at the ankle, braided welt, square toe, a comfortable 3 3/4" heel, and availability in larger sizes (Samanta Shoes go up to size 14), you will not regret adding this stylish, luxe boot to your wardrobe. The Dilla is on sale for $98.40 on www.amazon.com, but the quantity is dwindling quite fast. If you miss it, we suggest you check out her other available styles, so here's to you welcoming one or two pairs of Samanta Shoes to your wardrobe.